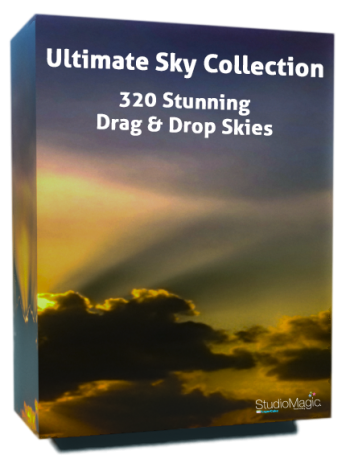 With our Ultimate Skies Bundle & our amazing new Drag & Drop Cloud Formations & CloudBanks You’ll never have Dull Skies Again! Sky replacement can take a lot of time, but not every sky needs a full replacement. Many images shot on cloudless days have brilliant blue skies, but they lack interest and the drama that cloud formations can bring. LayerCake has mastered the technique of shooting and extracting collections of individual cloud formations and cloudbanks, that you can easily drag and drop into your photos in minutes. Each Cloud Formation and CloudBank can be distorted creating perspective, stretched across a big sky, cut, duplicated and erased to get just the look you want. These are all new and not part of LayerCake's Sky Collections. 120 All New Drag & Drop Cloud Formations and CloudBanks from big puffy Cumulus to Wispy Cirrus, with a simple Drag & Drop, make any cloudless sky more exciting. Each Cloud Formation & Cloud Bank is a 300 dpi smart object that can easily be enlarged for any size image.